Vision International University offers degree programs for students seeking academic advancement and preparation for professional service in Christian Ministry. VIU was founded as a sister institution of Vision International College Australia in 1990. With administrative headquarters in Ramona, CA, the institution specifically offers flexible and affordable distance/online education in a variety of delivery methods. Vision International University was founded for education and training on both a local and international basis. From the beginning of the New Testament era, the Lord has used the local church and its pastoral leadership to teach and train its people for God’s service. Vision is an instrument to be used by and for the local church to fulfill its calling. The University campus and the administrative offices are located in Ramona (San Diego), California. The mission of Vision International University is to effectively educate and train, by means of distance education, men and women called to Christian service. The academic model shall be biblically based Christian higher education (undergraduate through graduate), for preparing Christian pastors, missionaries, church leaders, educators and other professionals for leadership in various fields of Christian service. This mission is to be accomplished through a Christ-centered distance education curriculum, of academic excellence, intellectual inquiry, spiritual and moral integrity, and practical experience. In this day of disappearing moral absolutes, it is imperative that all Christians be reminded that the Bible, as the revelation of God’s truth, must determine not only our doctrinal beliefs, but also our lifestyle. In a changing world, the Christian has an unchanging standard, The Word of God. The VIU “Standards of Conduct” are based upon the teachings and principles of Scripture, seeking to develop personal holiness and discipline exemplified in a lifestyle glorifying to God. communicate the Word of God to others. expound the Word of God in a systematic fashion, with his/her training in the analytical inductive methods of contemporary biblical scholarship. demonstrate genuine concern for missionary work around the world, with a special concern for the urban centers, as a missionary, volunteer, sponsor, or prayer partner. demonstrate Christian maturity with his/her commitment to Christ and His Church. continue a daily regular study of the Word of God as an autonomous learner, which is characteristic of servants of God. present a well defined, biblically based, intellectually and rationally sound , compassionate apologetic of their faith. know how to acquire knowledge. have an awareness of personal values. have a high level of mastery in the skills of communication. cooperate and collaborate with others in studying, analyzing, formulating, and implementing solutions to problems. have awareness, concern, and a sense of responsibility regarding contemporary events, issues, and problems. have a love, loyalty, and responsibility to/for the local church as God’s primary method for societal transformation and its development. know the voice of the Lord for his/her generation and articulate God’s plan with anointed power and conviction. In 1974, Vision began both in Tasmania, Australia and San Diego, California. Dr. Ken Chant, founder of Vision Bible College, began in Launceston, Tasmania. Simultaneously, Dr. Joseph Bohac and Dr. Stan DeKoven began Logos Institute, a local church training program in practical ministry and counseling. By 1977, Dr. Chant moved his school to Sydney, Australia, joining Pastor Allan Langstaff, where the Vision Bible College program grew. Logos Institute continued as a counseling ministry and training center, while Dr. DeKoven pursued studies in psychology and theology. By 1982, Dr. Chant moved to the United States (St. Paul, Minnesota). He established his program there. Dr. DeKoven returned to San Diego after having earned his doctorate and continued to expand the Logos program. Simultaneously, Dr. Randy Gurley, Chairman of the Board of Regents and Executive vice-president of Vision, began his Bible College teaching ministry eventually merging with Vision. By 1985, Dr. Chant, in response to a strong leading from the Lord, brought his outstanding Bible College to San Diego, California. Vision Bible College was legally and rightly incorporated as a non-profit corporation in 1985. By 1987, Dr. DeKoven and Dr. Chant had established a full-time, short-term campus and eventually merged their hearts and visions. The network of affiliated campuses, the desire of Dr. DeKoven’s heart, began to be established and has grown as is described hereafter. 1990 was a pivotal year for Vision. Dr. Chant, in obedience to the Lord, returned to his native Australia. Prior to his leaving, Vision Bible College, under Dr. DeKoven’s direction, had expanded to its present University status. A headquarters site was purchased in the beautiful community of Ramona, California, where the present headquarters continues to be based. A local campus and a counseling center are also located at this location. Since 1990, Vision has expanded its influence around the world, developing teaching centers in every continent. The curriculum of Vision attempts to maintain a non-dogmatic perspective, allowing students to study a wide variety of theological issues to formulate their own beliefs in an academic context. Vision maintains a strong emphasis on church planting, community service, and Christian character development. Teachers who exist to serve the student and they accept their primary responsibility before God to cause their students to learn. Decentralized classes – courses are taught within context of strong apostolic covering (fathering) and local church family life. All teaching will be centered in Christ – seeking to bring students into a Christ like life and thinking. To accomplish this goal, the teacher must themself be in a right relationship with the Lord Jesus. The teacher and his teaching must flow out of a walk with God and out of a relationship with Jesus. Learning will be carried out and proven in the context of community life (relationship). The student’s personal relationship with Jesus will be expressed and worked out in the daily life of his various communities: his family, his church community, the teams he is a part of, and the broader community of the world. Building strong character will be the goal of all training. (Not just impartation of knowledge) The indwelling life of Christ expressed and worked out in community will develop godly character. Will be observed, developed,and proven within the community. Competency in aparticular area of life and ministry is developed and nurtured in the environment of a loving community. Adapted from the Connexcions Model developed by Dr. Malcolm Weber, Developer of Leadership College of Vision International University…now the Universities adopted philosophy. Our role at Vision is to bring theological education and ministerial training to people who are unable or unwilling to attend a centralized higher education institution. 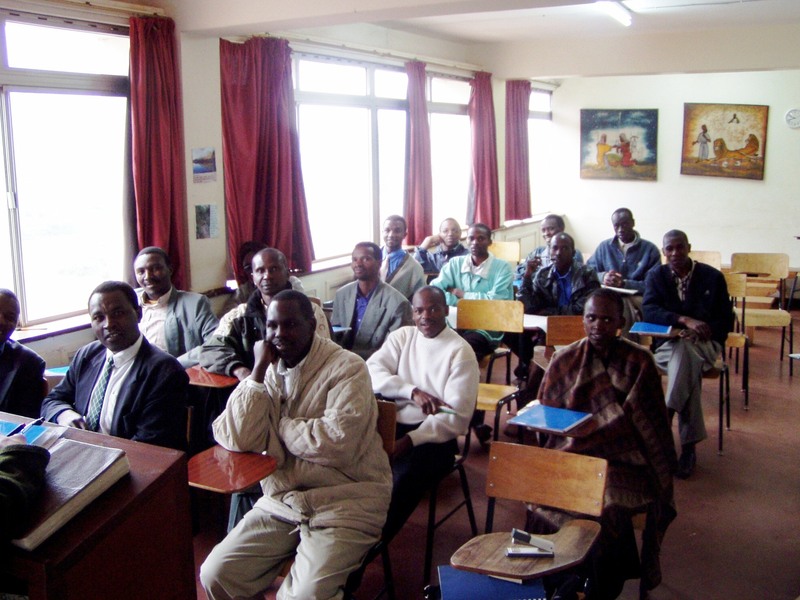 But more profoundly, while we admire and endorse the efforts of traditional Bible Colleges and Seminaries, we are deeply committed to the concept of training people within the super vision of their own local church, and to the provision of excellent teaching material and study options for Christians everywhere. We treat the entire local church environment as part of our educational activity: its worship, its witness, its fellowship, its teaching; its ministry – are all reckoned to be part of the training process of equipping men and women to serve Christ. Our function is simply to add a theological and academic resource that few churches can viably provide, while leaving the practical training in ministry to the local pastor. Students must be brought to know God, not just to learn about him, and the curriculum must be consciously structured to achieve that excellent end. The goal must be not just to impart knowledge, but rather to teach principles of sound interpretation, showing people how to do their own research, and how to apply truth to life. A final goal is the ultimate activation of men and women into effective Christian service, in any environment to which he or she may be called to minister. This is not intended to be a comprehensive statement of faith, but rather a guide to the doctrinal boundaries within which Vision functions. Those who share our spiritual identity will be generally familiar with the following terms, and will be able to fill in what is lacking. Local communities are encouraged, as designed, to develop a statement of faith that varies on minor points of doctrine, from Vision’s. That the victorious Christian life is built upon a proper understanding and exercise of the spiritual authority conveyed to the believer by the gift of righteousness. In the resurrection of the dead at Christ’s return, in the certainty of God’s judgment, and in the inescapable result of that judgment as foretold in the scriptures for the just and the unjust.